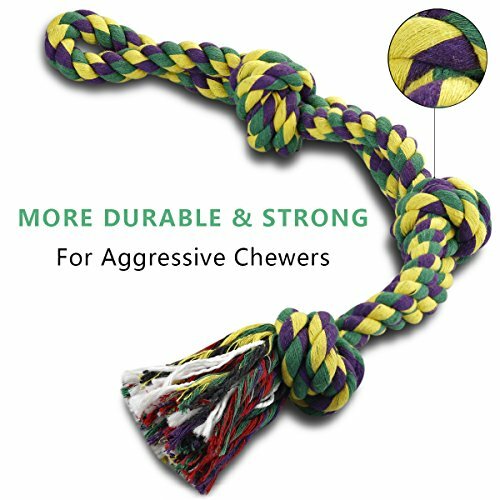 LEGENDARY QUALITY by RIO Direct: For pets safety, we only use WASHABLE 100% NATURAL COTTON FIBERS , safe for dental chew. 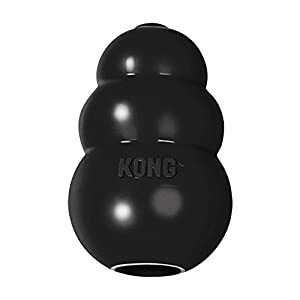 PERFECT SIZE FOR LARGE DOGS: Designed for large breeds & medium breeds. 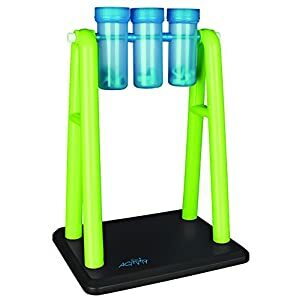 SUPER TOUGH AND DURABLE. 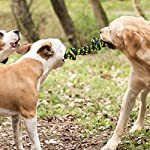 Extra large size 28 Inch 3 Knots rope tug best for aggressive chewers for tug of war or chewing training. 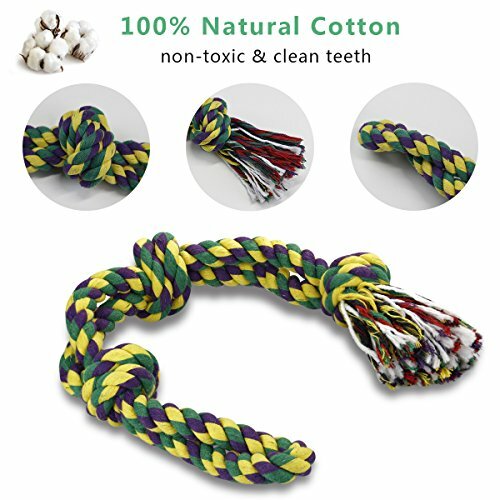 HEALTHY FOR YOUR PET: NON TOXIC Cotton CLEANS TEETH and MASSAGES GUMS and Can Help Fight Plaque Build-Up as Well as Help Prevent Gum Disease. 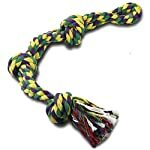 If you are looking for some rope dog toys for your large dog or extra large dogs. If you care about QUALITY, This tough dog rope toy will be your BEST choice! 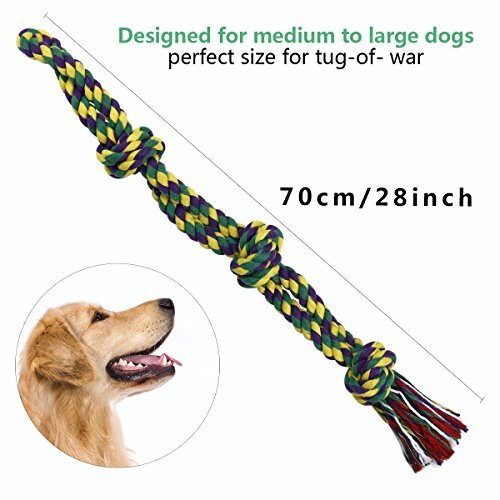 √ Designed for big dogs and middle dogs,longer lasting, Fine quality and good price! √ Dental Cleaning: Help to keep your pet’s teeth and gums clean and healthy, Stay away from plague and tartar . 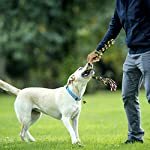 √ Help dog’s mental development, Make your dog get out of lonely and more activty. √ Decompression: Reduce the destructive behavior of dogs. 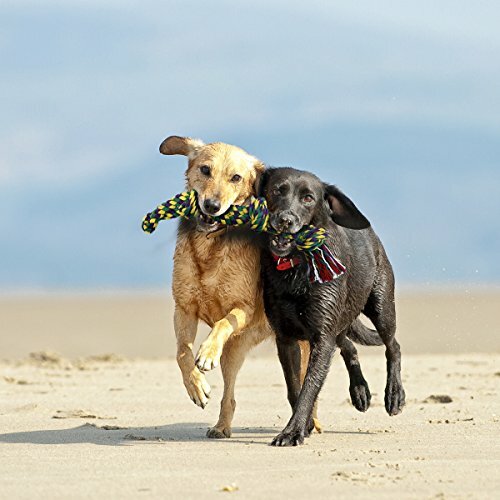 √ Keep your pet body fit: Cause their interest that let them in motion, Keep them body fit. √ Increase the emotion between your pet and yourself. Hurry! keep Your Dog Healthy, Happy, And Strong,Make Your Life More fun By Adding This Amazing RIO DIRECT Dog Rope Toy To Your Cart Today! 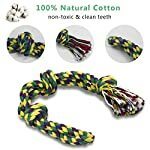 Like every other toy, the cotton ropes are not indestructible. 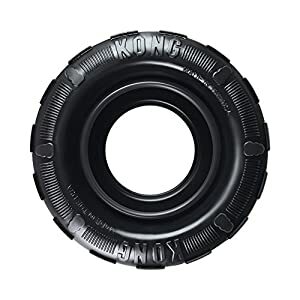 We recommend supervised play, and timely replacement of the broken ones. 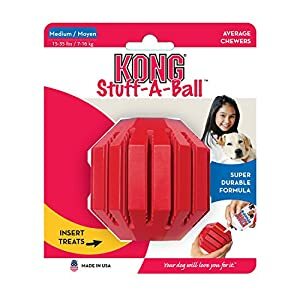 Please DO NOT LET YOUR BELOVED DOG SWALLOW THESE TOYS. 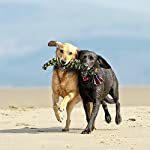 IMPROVE RELATIONSHIP:A wonderful gift for your lovely dog, available for both indoor and outdoor playing or trainning, better enhance feelings between you and your love pet.